MUMBAI, A LIVE WIRE CITY! Mumbai is land of dreams and made of seven islands! Seven is surely a blessed number since Game of Thrones is released. If someone is a not a follower of the series, (which is hardly possible I think) there are seven gods in the GOT. But this amazing city knew the importance of seven even before that. Mumbai as it looks today is actually built by connecting seven islands in the Arabian sea. So I call it the city of sevens. Mumbai is already known worldwide as the financial capital of India. So it’s central for Indian businesses, also for those international companies who are looking towards India for their future investment. But these are not the only great things about this city. This city is continuously attracting millions of tourists each year. If you are an art lover, if modern art excites you, then there is no better and peaceful place than Jahangir Art Gallery and National Museum of modern art for you. Thousands of old, new paintings are there for display. You will surely lose time’s track over here. After visiting these amazing places there is a museum waiting for you nearby. Yes! I am talking about Chhatrapati Shivaji Museum previously known as Prince of Wales museum. You can see whole Indian history at a glance. Some very precious artifacts are housed in here. Many Egyptian, Persian as well as Greek artifacts also comfortably rest at this beautiful palace of history. 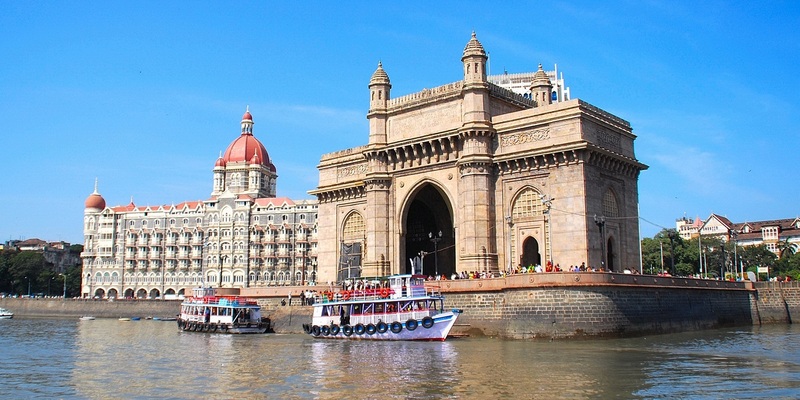 Then go to the Gateway of India by bus or taxi.. Also there is ‘the’ Taj hotel standing facing to the sea. These are good examples of british architecture. There are many good restaurants here where you can enjoy different types of food items. While walking in these areas you will see the heritage of Mumbai. Now let us come at glamorous life in Mumbai. Mumbai is a motherland of Bollywood. Many Indian superstars have made this city their home. Go to Bandstand at Bandra. See their amazing houses lined up along the shore. If you are lucky, you might find some superstar coming at the window and waiving at the huge crowd. Mumbai’s love for cinema cannot be explained better than this phenomenon. Then go a little away and watch the beautiful Juhu beach. There is a Iskon temple over there worth visiting. Along with these well-known places if you are willing to explore more, Mumbai won’t disappoint you. If you are a foodie and want to experience best chicken and mutton kebabs, go to Mohammad Ali Road situated at Masjid Bandar. There you will get many options especially in non-veg food. Visit Dadar for best Maharashtrian food. If you want to shop in reasonable price visit Ranade road, Manish market, Lamington road. There is nothing in this in world which cannot be found at these places. There is Rajiv Gandhi National Park which is a nice place to visit to get a small wildlife experience. So I can say that Mumbai is a whole package. But there is one thing you must be aware of. This is a big and very busy city so if you get stuck in traffic, your timetable might get in trouble. If you have booked a room at a hotel near CST and you are stuck at Borivali Near Rajiv Gandhi national Park, consider it as a 2 hrs. delay in your time table. So while these are all the problems there is just a best solution provided by Frotels.com. Now you can book hotel rooms on hourly basis. So now there is no need to book rooms for whole day at a faraway location and waiting in traffic at another location. Just book hotels where you are, save time and money. And head for another adventure. This is also very useful for businessmen visiting for short time, musicians on a tour. Many who are traveling by connecting flights from Mumbai can refresh themselves in the time between the flights instead of waiting at airport. They can even work and have meetings in this time. I will say at the end, experience Mumbai comfortably with Frotels. It’s an innovative idea. Have a great time in Mumbai!